Chiang Mai is a glittering diamond in the crown of Thai cuisine. 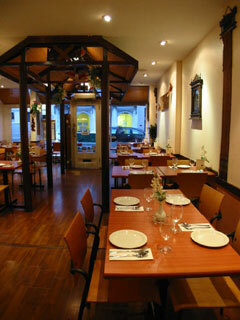 Established in 1985 in the heart of Soho, Chiang Mai is one of the first Thai restaurants in London. It is named after the ancient northern capital of Thailand, a region famed for its rich, spicy foods. Step inside this restaurant and you are utterly transported from the hustle and bustle of Soho into a relaxing Thai dining room. Chiang Mai offers a warm, modern interpretation of Eastern hospitality; It offers a lovely blend of subtle Thai charm with a modern minimalist decor. The cream walls are decorated with ornate Thai figurines and lovely mirrors creating a cool, fresh vybe. The service is charming and offers you the traditional warmth of Thai hospitality. Enjoy the fresh, beautifully presented food and give into the temptation! Chiang Mai is a northern province of Thailand, and is popularly known as �The rose of the north�. With an enchanting location on the banks of the Ping River, the city and its surroundings are blessed with stunning natural beauty and a unique cultural identity. Chiang Mai province also boasts a sumptuous cuisine of its own, which is available form the menu and should not be missed. Try deep-fried Chiang Mai hot and spicy sausage (Si Ooah) and special Chiang Mai spicy minced chicken curry dip with prawn crackers (Nahm Phrik Ong). Chiang Mai offers exclusive use of the upstairs private dining area and caters for all types and sizes of group bookings. The management will provide a vibrant and exclusive dining experience customised entirely to your individual needs. Try one of the set menus they are great for business lunches, intimate dinners, or whenever you need a change. The menu combines a variety of familiar Thai restaurant staples and all time favourites including pad Thai noodles, delicious curries and stir-fried dishes, which are accompanied by fragrant rice or noodles. There are also some new and innovative dishes, which deserve particular attention. Seafood lovers will be in awe of the extensive seafood menu and there is a separate vegetarian menu, which features a range of starters, curries, noodle dishes and main dishes. There is a wide range of set menu�s including a vegetarian.